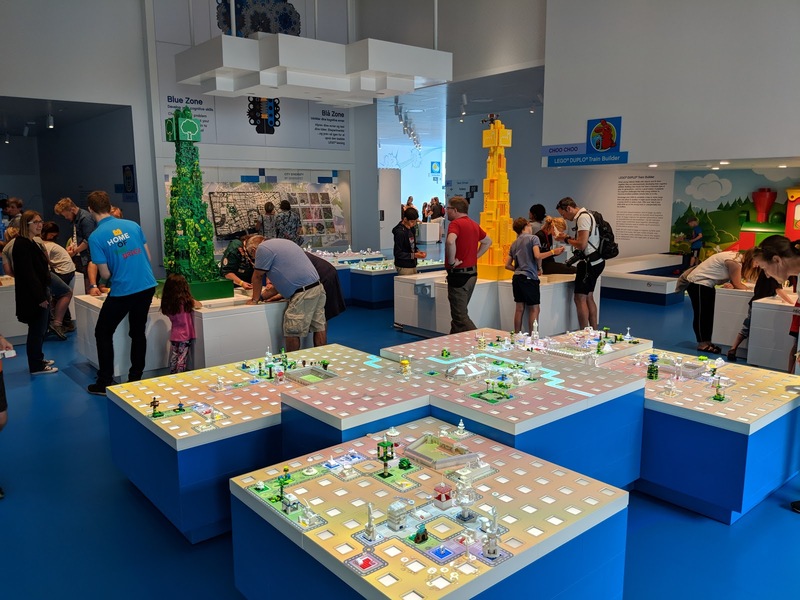 As I mentioned previously in the last post - all the experiences at LEGO House has been divided into four different spaces or zones - Red Zone, Blue Zone, Yellow Zone and the Green Zone. 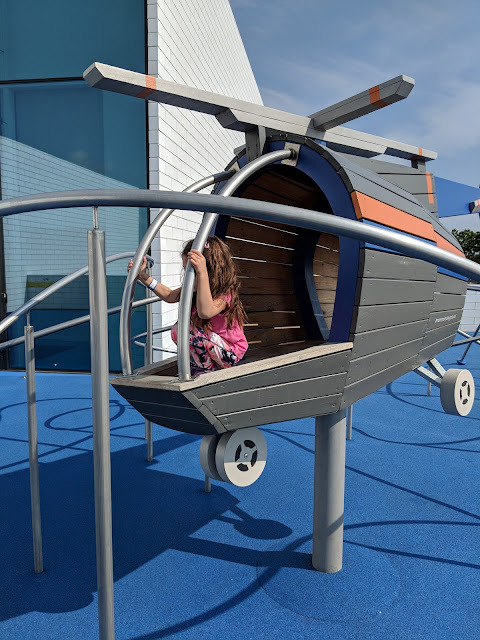 The Masterpiece Gallery can be easily accessed from each zone and features builds like the dinosaur in the previous post. I forgot to mention as you make your way into the LEGO House Experience, you walk up the stairs around a massive LEGO tree. It is called the "Tree of Creativity," and stands at 15 meters tall and is built from over 6 million bricks and took many, many hours to create. The Red Zone is for creativity, which brings you to the LEGO Brick Builder, the Duplo Brick Builder and the Creative Lab. As you can see to the picture to the left, the LEGOs just cascades into a waterfall of bottomless pools of LEGO bricks. We spent an hour here before we moved on to the other zones. It is not to say that we did not circle back to this zone near the end. Preparing to dive into the pool of DUPLOs. The Blue Zone calls upon logic to help solve complex problems and find solutions. The little lady and I were able save the frozen mini-figures by taking command of an Arctic Explorer Robot in the Robo Lab. You can also build a city or build a car in this area. The final product - the little lady had built and rebuilt this pink car and had tested it on one of the tracks for speed, aerodynamics, safety and efficiency. 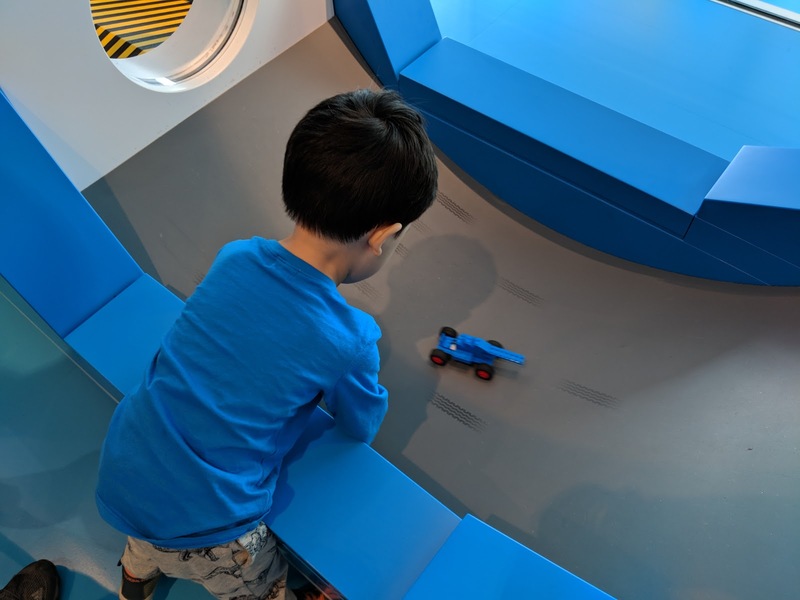 The little mister testing his blue car down the ramp. One of the trees built for the city. 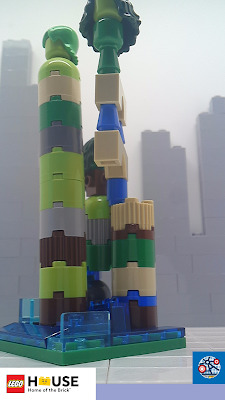 The City being built is in the foreground while in the background, you can access each section needed to build up the city from trees to buildings to transport. On the next zones - Green Zone and Yellow Zone. Stay tuned for that post!